A new report provides insight into how traffickers move cocaine to the lucrative European market, including the key trafficking routes and smuggling techniques criminal groups have adopted to skirt drug interdiction efforts. 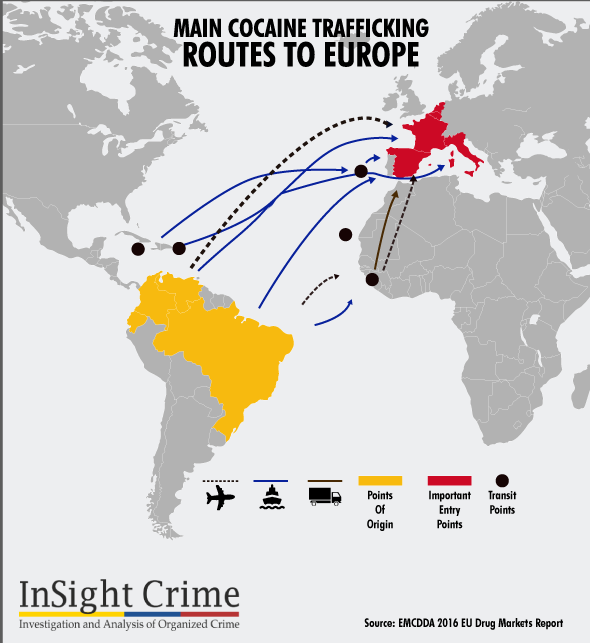 The recently released 2016 EU Drug Trafficking Report by the European Monitoring Centre for Drugs and Drug Addiction (EMCDDA) and Europol explains Latin America’s role in the European cocaine industry, and the different routes and methods used to traffic the drug across the Atlantic (see map above). Colombia, Brazil and Venezuela are singled out as “key departure points” for Europe-bound cocaine, from where the drug is smuggled out in vessels, private yachts or by air, among other methods. According to the report, the increasing importance of Brazil suggests that Bolivia and Peru are expanding their role as suppliers for the European market. The traffic of Colombian cocaine into Venezuela across a “porous border” has similarly increased. From Venezuela, criminal groups use both flights and maritime routes — capitalizing on the busy traffic off the Venezuelan coast — to send the drugs to Europe. Despite data from the United Nations Office on Drugs and Crime (UNODC) suggesting otherwise, the report adds, Colombia is likely to continue being a key shipment point for cocaine heading to Europe, as evidenced by its growing production figures and continuing seizures. Ecuador and Argentina are also mentioned as departure points for the drug. The Caribbean and West Africa are reportedly the two most common transit zones for cocaine moving across the Atlantic, and Central America appears to be becoming an increasingly important stop-off point. The Caribbean Sea’s main trafficking hubs are the Dominican Republic and Jamaica, although there have been reports that some activity has shifted to Caribbean countries further east. Central America and the Caribbean was the only area to see a rise in cocaine seizures in 2013, with confiscations nearly doubling to 162 metric tons from 78 metric tons a year earlier, according to the EMCDDA. Behind the increase was a 800 percent spike in Dominican Republic seizures, which reached 86 metric tons in 2015. The apparent escalation of illegal trafficking through the Caribbean is described as a possible result of recent crackdowns in Mexico and Central America. West Africa’s Bight of Benin — between Ghana and Nigeria — as well as the islands of Cape Verde, Madeira and the Canary Islands, make up the second major transit zone for cocaine heading to Europe. Nevertheless, the report points out that the Bight of Benin may be have lost importance in recent years. Once on the other side of the Atlantic, cocaine continues its journey by sea, land or air, principally to western or southern Europe. In 2014, Spain, Belgium, the Netherlands, France and Italy reportedly accounted for 80 percent of the 61.6 metic tons of cocaine seized in the European Union. The largest ports on the continent — Rotterdam in Holland, and Antwerp, Belgium — are thought to be key entry points for cocaine. Dutch police estimated that 25 to 50 percent of all cocaine filtered into Europe through Rotterdam, following the seizure of 10 metric tons of the drug at the port in 2013. Of the 11 million containers that pass through the Rotterdam annually, only 50,000 are scanned (0.45 percent). Other key entry ports are Algeciras and Valencia in Spain, and Hamburg in Germany. The EMCDDA expressed increasing concern over the use of existing trafficking routes for other drugs to move cocaine, including cannabis corridors in Morocco and Algeria and heroin corridors in Tanzania. The report warns that Tanzania may emerge as a new cocaine route to Europe, given an increase in seizures in East Africa and as a consequence of the Panama Canal’s expansion. The vast capacity for moving drugs and diversity of routes offered by maritime transport makes it the preferred option for cocaine traffickers to Europe. Traffickers are increasingly hiding cocaine in shipping containers aboard commercial vessels, which makes it harder to detect. Seizures involving containers have reportedly gone up sixfold since 2006. Colombian and Italian organized crime networks reportedly continue to dominate the cocaine trade in Europe, in cooperation with Dutch, British, Spanish and Nigerian groups. The Netherlands and Spain are primary distribution centers. One of the most interesting trends highlighted by the report is that traffickers prefer to transit through the Caribbean rather than Central America on their way to Europe. While this may appear to be the easiest route, in the past organizations were known to send drugs to Central American countries before crossing the Atlantic. The theory that the Caribbean is re-emerging as a popular drug route as Central American traffic declines has been suggested since at least 2010, and evidence over the years has both supported and refuted this theory. There is a general consensus that tougher interdiction in Central America and Mexico is behind the supposed revival of the Caribbean corridor that had been popular in the 1980s, although such predictions have mainly be applied to drug trafficking to the United States. Still, it appears that the Caribbean route is more significant for Europe-bound cargo, as Central America remains the main trafficking corridor for northbound narcotics. Another revealing takeaway from the report is the evolution of trafficking techniques used by criminals to skirt interdiction efforts. The growing use of shipping containers to move cocaine demonstrates how criminal organizations are taking advantage of increasing global maritime traffic to run their business. Part of this trend is the increasingly popular “rip-on/rip-off” technique, which relies on the use of corrupt port officials to slip drugs into legitimate containers by breaking and replacing the security seal at the point of origin. Concealing cocaine with perishable goods also ensures the drugs pass through controls faster. It is unsurprising that traffickers should take advantage of shipping routes — maritime trade handles tremendous volume and is a sector often overlooked in the fight against organized crime, providing the perfect cover for drug smugglers. In addition, corruption, informality and a lack of resources in many departure portsmakes it easier for groups to smuggle their drugs onto ships. Such is the case in Peru, where Mexican traffickers reportedly control Pacific drug routes to Europe. The report illustrates how criminal groups must be consistently creative to survive, noting new smuggling techniques used by drug mules that include ingesting liquid rather than powder cocaine, and concealing drugs in breast implants. Europe’s relevance to the global cocaine trade is not to be underestimated. High profit margins for traffickers and a saturated US market are likely to increase its importance in the coming years.